Recent experiments with the AIR runtime environment, native process and FFMPEG got me thinking about digital video. The digital strands of narrative intertwine in a confusion of naughts and ones. Auditory vibes harmonise with the luminosity of performing pixels conducted by semiconductors fluent in machine. FFMPEG is a decoder/encoder for digital content capable of converting one video format to another, separating audio from video, breaking video up into frames as jpegs and so much more. One of the most basic features that interests me the most about FFMPEG is -s (size parameter). FFMPEG uses this parameter to scale the video as its being converted. As a person of great ability in the art of procrastination instead of the task in hand I began contemplating the consequence of encoding a video into a containing dimension of 1×1 pixels. After some experimentation I disproved my first naive/romantic hypothesis of what this 1×1 video might produce. Without considering the repercussion in depth I thought that the result of this scaling might produce a colour narrative, a timeline of mood brought forth by hue, saturation and brightness presented by a single pixel against an axis of time. The reality is that FFMPEG is only able to resize and scale video in factors of 2 so next I tried a 2×2 pixel square. Still the notion of a colour narrative was far out of reach as once encoding of the 2×2 video was complete the playback result was a grayscale blur. The result was definitely not a consequence of the colours within the video. I decided I would try the process one more time only with a 4×4 pixel result so that more of the colour detail was kept. I was extremely pleased with the result at 4×4 the mood of the video was very apparent but the detailed had definitely been dissolved. I enjoyed the extra bonus that the audio had been preserved to compliment the mood of the frames. I intend to follow this up with some experimental data visualisations of the pixel colour over time very similar to this example by Brendan Dawes but for now see below for the result of the 4×4 square scaled back up to 320×240. Recently, I have been really enjoying AS3 because of its versatility. The projects I have been working on are growing quite complex and hard to manage. The main issue I have been having is remembering what each class does. I have been very careful to comment code but sometimes it would be nice just to have a document that describes all variables, methods etc. Today I started looking at automated systems to create documentation from AS3 project code and I came across NaturalDocs. Its a very simple to use command line tool which goes through all my project code reading the comments and structure. NaturalDocs then creates a full blown website documenting the code. A couple of weeks ago I wrote an application in AS3 that used FFMPEG for video manipulation. The application utilised the NativeProcess class from adobe air to execute native processes via the command line. The technique really adds another level to the versatility of AS3. Since the video app I have been itching to use the technique again so I decided to make a very simple GUI for NaturalDocs. 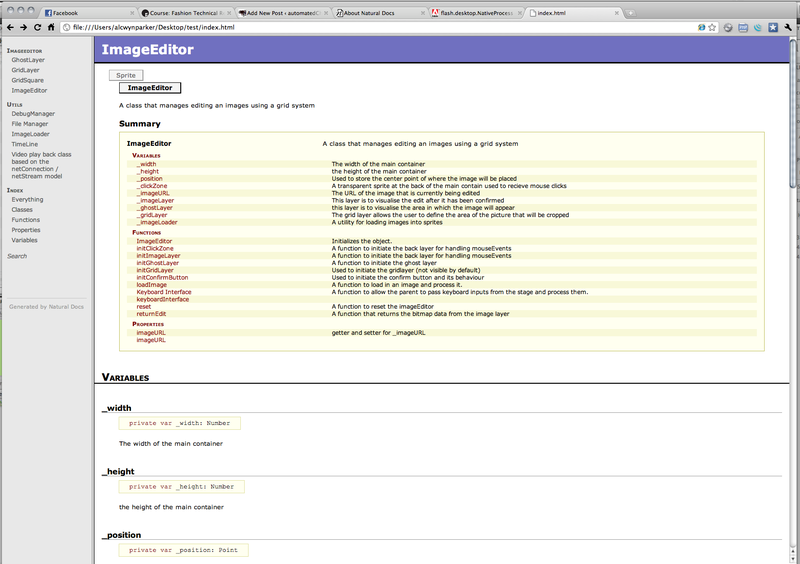 The picture above is a screen shot of an air app that has NaturalDocs embedded in. 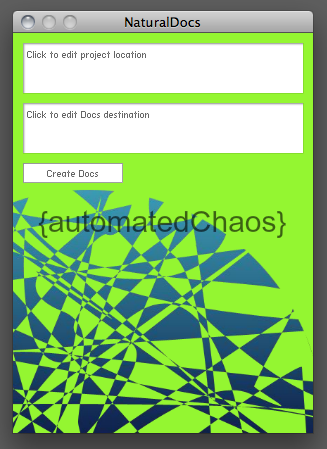 The app is very simple all the user has to do is click the top box and locate the project code then click the second box and define a folder for the destination of the docs. Once “create docs” is clicked NaturalDocs goes ahead and creates the documentation for the code. Its very simple but hopefully it will be quite useful. I was very impressed with the work that Greg Valure has done on NaturalDocs its a very intuitive and efficient system to use. Some of the AS3 resources I have been working on are becoming very useful. I can’t wait to start documenting some of the more universal classes I have written and then releasing them into the great wild west that is the internet. I will upload the app and post link to download it soon. I don’t think this would break the GPL license the NaturalDocs project is licensed with.